Pathology is of the air filled larynx and trachea, including the region of thyroid and thymus glands and upper esophagus for opaque foreign object or if contrast medium is present. Soft tissue lateral frequency is taken to rule out epiglottis, which may be life threatening for young child. IR size - 24 x 30 cm (10 x 12 inches), lengthwise. Patient should be upright if possible, seated or standing in a lateral position (may be taken in R or L lateral and may be taken recumbent tabletop if necessary). Position patient to center upper airway to CR and to center of IR ( larynx and trachea lie anteior to cervical and thoracic vertebrae). Rotate shoulders posteriorly with arms hanging down and hands clasped behind back. Raise chin slightly and have patient look directly ahead. CR perpendicular to center of IR at level of C6 or C7, midway between the laryngeal prominence of the thyroid cartilage and the jugular notch. Collimate to area of interest. Male exposure during slow, deep inspiration to ensure filling trachea and upper airway with air. 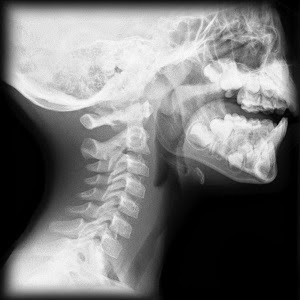 Centering should be to laryngeal prominence (C5) with exposure factors for a soft tissue lateral neck if the area of interest is primarily the larynx and upper trachea. If the distal larynx and the upper and midtrachea are the primary areas of interest, the IR and CR should be lowered to place the CR at the upper jugular notch (T1) with exposure factors approximately those for a lateral chest.